Background Phenomenology can often be used as a general approach in studies exploring ‘experience’. However, social phenomenology can be seen as a distinct methodological approach for nursing research. Aim To provide a reflective account of adopting social phenomenology as a preferred methodology in nursing research. Discussion Personal identity and philosophical viewpoints are not fixed and can change over time, in part due to evolving debates and influences in nursing. 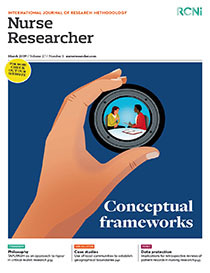 People construct meaning in the context in which they are situated and can contribute to researchers’ standpoints at a particular point in time. This paper reflects a personal journey through various research influences to culminate in adopting a qualitative research methodology that draws on social and hermeneutic forms of phenomenology. Conclusion The importance of continually revisiting our own positions as nurse researchers is proposed, to justify our chosen study approaches in a critical and transparent way. Implications for practice Exploring and understanding patients’ experiences and their perspectives is fundamental to evidence-based nursing practice. Social phenomenology can provide a framework to explore the intersubjective dimensions of care, valuing the socio-historical and cultural aspects that influence behaviours, thoughts and actions.